Since the beginning of 2017, 5,000 administrative procedures and 24 conditional business lines have been trimmed, with another 3,000 business conditions on the chopping block, the Vietnamese Government said recently. Last February, the Government adopted Resolution 19 aimed at improving its investment environment and elevating national competitiveness in 2017 with a vision toward 2020. Thanks to efforts made under this unifying guideline, Vietnam’s economy has jumped 14 positions in the World Bank’s doing business ratings. The figures were disclosed in a meeting held on February 8 in Hanoi by the Government’s Steering Committee for Administrative Reform to review its activities in 2017 and plans for the year 2018. 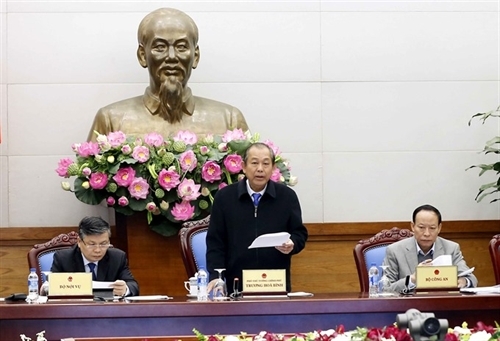 Minister of Home Affairs Nguyen Trong Thua said the Government has promulgated a total of 17 resolutions approving measures to simplify administrative procedures and other legal processes related to residence management as well four resolutions ordering ministries to review and trim administrative excesses related to business conditions that stymie production. Currently, 17 out of 19 ministries and ministerial-level agencies have been making use of online public administrative services, with 549 services available at level 3 (forms can be downloaded and processed online) and 377 services available at the highest level or level 4 (forms and payments can be made and processed online). Fifty-eight out of 63 provinces and municipalities have been offering a total of 13,830 public administrative services at either level 3 or 4. Nguyen Thi Minh, head of Vietnam Social Security, said that administrative reforms are a “matter of life and death” for her agency. Previously, the sheer workload required social security workers to work even on weekends and many quit under that pressure. Thanks to procedures simplification, now the staff only needs to work on Saturday and can have the day off on Sunday. Aside from the positive gains in 2017, many shortcomings have been pointed out. Deputy Minister of Justice Tran Tien Dung at the meeting pointed out that issuance of legal documents is still rampant in 2017, with the number of law-breaching documents found to have increased by 21 percent compared to 2016. The justice ministry, in reviewing nearly 6,000 legal documents last year, has detected 157 documents that contain legal violations, either in terms of their contents or jurisdiction of the issuing authority. Also according to the justice ministry, only half of the offending documents have been rectified so far. Deputy Prime Minister Truong Hoa Binh, chairman of the administrative reform committee, said progress on building an e-government is underwhelming while cumbersome red tape continues to drag down the economy’s potential. “The fault lies in the inertia of the administration at all levels in making changes to themselves, weak compliance on the bureaucrats’ part as well as insufficient knowledge, experience and ethics, all of which slows down the progress of reforms,” Binh said.